The Shenandoah Mountain 100 the final race of the U.S. National Ultra Endurance (NUE) series is my favorite… at least of the 6 out of 9 that I’ve done. 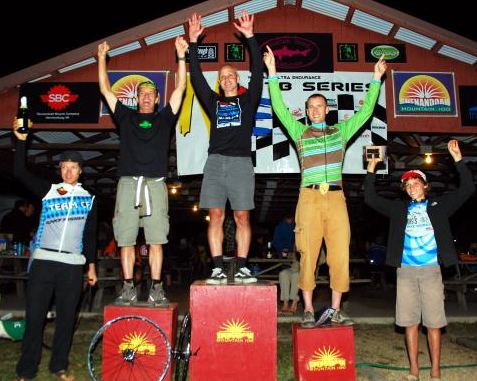 The SM100, as it’s called, combines all of the best aspects of mountain bike racing into one fantastic grueling event and one great weekend of camaraderie. It’s the time to test your fitness one last time against your rivals and afterwards a time to sit down and count your rivals as your friends as your share war stories over a beer. 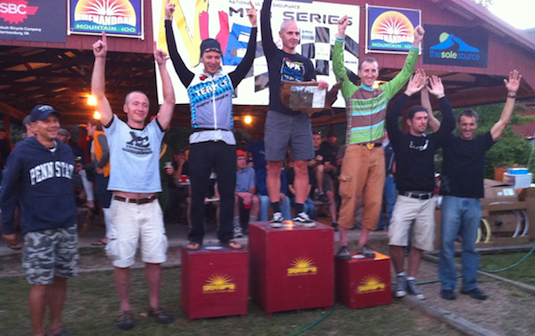 SM100 is a celebration of mountain bike racing. There’s no hiding. There’s no sitting in and being fortunate enough to be in the right break. With over 12,000 feet of climbing combined with tricky rocky descents, it always ends up being a grueling day. I’ve done this race 3 times now and I have yet to have what I would consider a good race… but I always come away feeling good about the racing experience and the people I meet along the way. I lined up on my amazing Superfly Single Speed with 65 other single speed riders to test my power, skills and endurance for the final 2010 NUE event. Despite feeling great during an hour long warmup ride the day before, I really couldn’t produce any power during the race. My heart rate was really low and revealed that I spent most of the day in heart rate zone 1… not good. It wasn’t for lack of trying. Unfortunately, this type of situation usually points to lack of rest. With a fair bit of ultra endurance experience under my belt, it’s a bit disappointing that I allow these situations to occur, particularly at the SM100, the race where everyone wants to put in their best performance of the year. The course was really enjoyable this year despite the lack of response from the engine room. 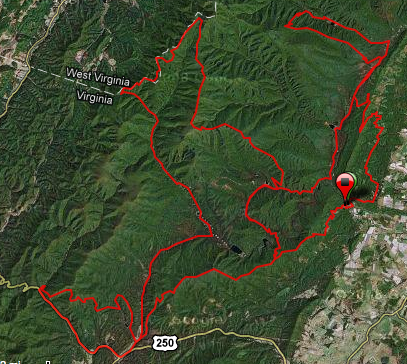 I felt really dialed on the descents off of Wolf Ridge, Bald Ridge and Bald Knob. I exchanged positions with fellow 29er Crew teammate Jason Pruitt and Indy Fab/Cupcake Factory rider Travis Coldsmith, both on single speeds. Eventually they both slipped away and finished in front of me. While we were suffering up the Bridge Hollow climb, Jason was kind enough to let me in on the secret to eliminating the creaking from my drive side sliding dropout… Grade 12 steel socket head screws. Apparently stainless steel does not have adequate strength properties to do the job. Thanks bro! I ended up 13th on the day in single speed at just over 9 hours. That was good enough for 7th in the Series… well enough to make the series podium just behind Jason who finished 5th. I’ll take it. In the men’s open Christian Tanguy finally got his due, winning the overall by over 5 minutes. I think Christian has been the strongest rider since at least the Wilderness 101. I’m glad he was finally able to have a mechanical-free race and win one this year. Hats off to you Christian! 2010 NUE champion Jeff Schalk was able to hold onto 2nd on the day. Congrats on 2nd but even more so on another NUE title. You are truly the King of Endurance. Fellow Crew teammate, the Rock Star Chris Beck was 3rd on the day. Woot! The story goes that Christian started attacking early to the point where only Jeff and Beck were left in the front group. Christian kept attacking, Jeff would follow, Chris would get gapped… but he kept coming back! He refused to be dropped! Not to forget Crew member Michael Simonson who finished 8th on the day and an incredible 3rd in the series. What a year Mike! 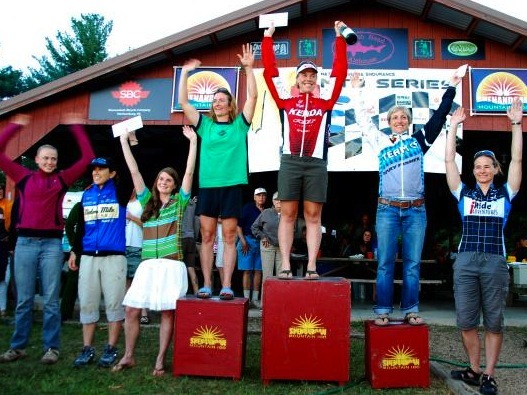 For the women, Amanda Carey proved she’s the Queen of Endurance at least for 2010. She only did 4 races… and won them all. That’s all it ever takes if you include the final race in your list of 4. 2nd place Sue Haywood really wasn’t that much slower than than last year despite really no training. I’m sure you were rockin’ the downhills girl with your new downhillin’ skillz. Cheryl Sornson from Team CF was 3rd on the day and 2nd in the series behind Amanda for 2010. Well done Churtle! Finally, I must acknowledge Freeze Thaw Cycles rider Vicki Barclay who had a great ride to finish 5th on the day which was good enough for 4th in the series. Without a doubt, I’ve ridden more NUE race miles this year with Vicki than with anyone else. She has been kind enough to let me draft her on her geared bike for at least 50 miles this year. Thanks girl! 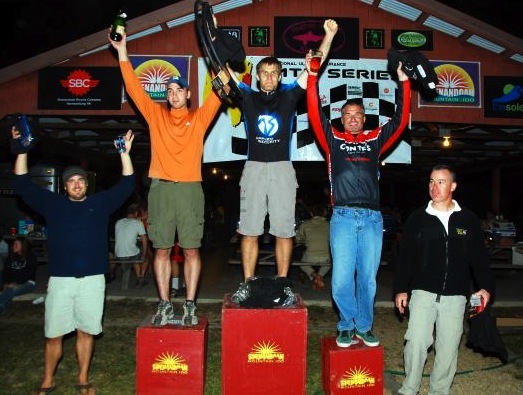 In the single speed, Gerry Pflug won the race for the first time and earned the NUE series title for the 2nd time. Well done my friend. You are still the man to beat! Team CF rider Harlan Price, riding injured from a bad crash at the Fools Gold, was able to finish in 5th on the day and capture 2nd in the series. Harlan’s an amazing rider who I’m sure is going to be back with a vengeance next year. I’m not sure how race promoter Chris Scott predicted this, but the other rock star, Indy Fab Mike Ramponi managed to pass Freeze Thaw Cycles Matt Ferrari in the final two miles to claim 2nd place on the day! Are you kidding me? Great ride rock star! 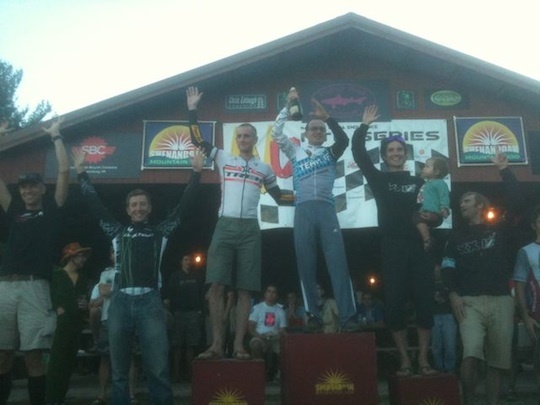 Matt rode well enough for 3rd on the day and 3rd in the series. Very consistent. Very solid. Finally, that little kid on the right? He’s Dylan Johnson and he’s 15 years old and he’s awesome! Finally a shout out to my friend Steven Godlewski tool over 2 hours and 15 minutes off of his 2009 time to finish 2nd in the Clydesdales division. I’d say that gets the most improved award! The 2010 edition of SM100 is in the books. We were fortunate to be given a perfect weekend weather-wise. It was sunny and in the high seventies for the high. There was food and beer and lots of hanging around the camp pavilion. It was a weekend of putting our differences aside to celebrate the thing that binds us together, the sport of endurance mountain bike racing and the end of another year. Ladies and gentlemen, please stand up and give a round of applause to Chris Scott and Jake Brown of Shenandoah Mountain Touring and ALL of the volunteers who perform countless tasks before, during and after the race to make our racing experience the best it can possibly be. The Shenandoah Mountain 100 is the best weekend of the summer. For those of you that participated this year, I know I’ll see you next year. If you haven’t experienced it, you really ought to in 2011. This entry was posted on September 10, 2010 at 4:31 pm and is filed under Must do Races. You can follow any responses to this entry through the RSS 2.0 feed. You can leave a response, or trackback from your own site. Hi Erik – Can’t mention everybody and I thought about the Masters a fair bit, especially since next year I’ll be one. With the front runners Robert Herriman and Bill Nagel missing and John Williams not racing as well as last year… I didn’t think the Masters race was that exciting this year. You had a good series though… Congratulations!